Music festivals provide a kind of “blueprint” for brands to estimate fairly well what type of demographic will be present. Having a captive audience to get the word out doesn’t hurt the bottom line, either. The next step is coming up with clever branding that is memorable and will get people talking. Communication and interaction are key. Brands simply can’t just give away a t-shirt with their logo strewn across the chest and expect people to wear it anymore. A sense of motivation and creativity needs to be involved. In comes the fairly new idea of “brand activation” — designed to memorably engage your potential or current customer with your brand, with the end goal being that they actually remember whom you are, love your product, and become (or continue to be) your customer. Here are 5 branding ideas tailored for the popular music festival Coachella. 1.) Tastemaker Marketing with ink+cotton: We know you want to focus on your VIPs, so why not choose unique, memorable promotional items such as skateboard decks or shoes from Converse Chuck Taylor, Vans or Toms. We’ve printed on all of these for past clients! By opting for an uncommon promotional item and having it live screen-printed, you’re embedding yourself in the memories of your tastemakers—and allowing them to reinterpret your brand’s image in their own way, which lets them create something for themselves. 2.) Custom Screen-Printed Coachella Posters: If custom screen-printed posters aren’t up any Coachella fan’s alley, we don’t know what is. Not only are posters like this both trendy and classic at once, your guest will get to choose their favorite design and can even choose where it should be applied to their poster. 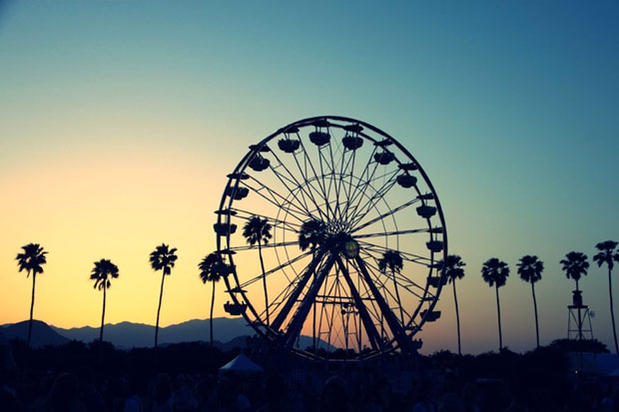 Ink+cotton would love to provide you this creative, cutting-edge brand activation at Coachella 2015. 3.) Digitally Printed T-Shirts: For digitally printed custom t-shirts, we start by creating the experience on ink+cotton iPads. Our friendly staff will help guests choose their design, which, they’ll be surprised to learn, can be anything digitally available, such as an image from an Instagram feed. Once a design or image is chosen, guests will be able to watch as their t-shirts are digitally printed instantly, right in front of them! Think of it as an ink jet printer, only instead of putting paper through, we’re putting a t-shirt or tote bag through. There are endless possibilities with this digital design option, especially at a music fest like Coachella, and ink+cotton is the only company printing directly to fabric right now! 4.) Live Screen Printing: Ink+cotton can live screen print tees, totes, tanks, almost anything made out of fabric. We have found that at every event we do, people are amazed at our process and ask us how we do it. Live screen-printing brings with it a lesson in how a t-shirt is made, and our staff is more than happy to explain the process to your guests. We encourage you to create multiple designs for your guests to choose from. An audience like the one you’ll find at Coachella calls for some creative, bright design options. Make your guests remember their experience, and be proud to bring your brand home with them. 5.) If you’re still reading and you’re looking to offer your guests an unforgettable event with something no one else has done before, give us a call. We’d love to pitch some new ideas to you. When an event like Coachella sells out months in advance, your brand’s best bet is to offer a unique experience so festival-goers are left with an impression. When standing out as a brand is important, ink+cotton is here to help spread the word in an exceptional and memorable way.